The region of the Big Island is the most beautiful coastal southeastern Brazil and point of artists and all who wish to enjoy an intimate contact with nature. Angra dos Reis is located 155 Km from Rio de Janeiro. 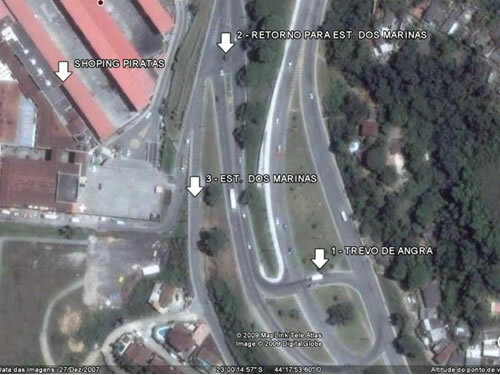 Coming from Rio de Janeiro toward BR 101 Rio Santos arriving at Clover Creek go to your left, go ahead and see the sign "Welcome to Angra dos Reis", then turn to your left to go to the street Pirates Mall shopping and move on approx. 1km until you find the plate INN red. Angra dos Reis is located at 395 km from São Paulo, almost totally covered in BR-101 (Rio-Santos highway). Angra is also achieved by the Via Dutra, followed by Mansa and taking the RJ-155 road for another 80 km, passing through town Lidice (Rio Claro - Angra), until you find the Rio-Santos BR 101 does not come in the first inning of Angra that goes to the city, following up the balloon and go left under the plate "Welcome to Angra" and enter the left lane for passing and climbing onto the street from the shopping mall called Pirates of Marinas Road, 991 - Marinas . INN find the plate in red. 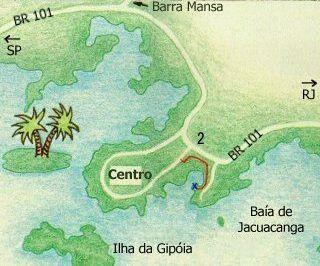 To get to the Pousada do Alemao should pick up entry (2) to the center of Angra dos Reis, as marked on the map. Among the first entrance on the left, reaching the road Marinas. You'll pass by a mall (Mall Pirates), which indicates that you are on track. Pousada do Alemao is on Highway 991 in the Marinas.